Courts IDC pool draw on September 6, 2018. Photo: Ronald Kumar. Vision Investments Limited and the Fiji Football Association have signed a five- year partnership for the annual Courts Inter District Championship. The partnership is to run from 2018 to 2022. This was announced in Suva yesterday during the official 2018 Courts IDC pool draws and also the handing over of $120,000 for the hosting of the competition. Speaking during the signing of the partnership Courts chief executive officer P.L. Munasinghe said they are happy to be sponsoring the competition. “Courts will be continuing the sponsorship for another five years,” Munasinghe said. “This year the IDC will mark its 80th anniversary as it will be a significant year for the competition. 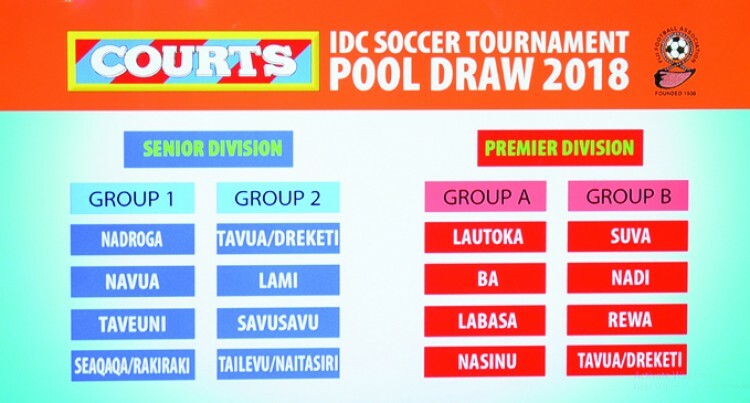 “Courts IDC is a very special tournament in the Fiji FA calendar as it has a festive atmosphere to it. Fiji Football Association president Rajesh Patel acknowledged Courts’ support for the competition and the extension of their partnership. “We would really like to thank the management of Courts for their tremendous support for the competition. “Without sponsors Fiji Football cannot organise competition as such. “Without the full sponsorship we are not able to fulfill the aim of making Fiji one of the best football playing nations in the Oceania region. “Our aim is to qualify for the 2026 world cup and this sponsorship helps us to achieve our aim,” added Patel.